The Greenpeace website has an address that’s similar to Alberta’s official tourism page. Greenpeace has launched a tongue-in-cheek website touting the tourism potential of the Alberta oilsands. 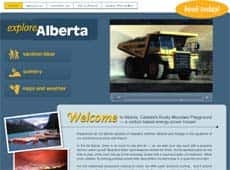 The site, which has an address similar to Alberta’s official tourism page, is the conservation group’s response to the province’s $25-million campaign to improve the environmental image of Alberta’s energy industry. The Greenpeace-produced site promises visitors “beautiful black sand beaches [that] stretch for miles,” toxic lakes and clearcut forests. “Try open-pit paragliding and ride the unique coal bed methane and sour gas updrafts,” a male announcer says over a slide show of familiar Alberta landmarks, grinning tourists and panoramic shots of the oilsands. Earlier this year, Alberta Premier Ed Stelmach announced his government was launching a $25-million campaign to polish the province’s environmental image. This week, the Canadian Association of Petroleum Producers unveiled a website to promote what the industry is doing to cut greenhouse gas emissions and limit water consumption. “We thought we’d help the province and CAPP [the Canadian Association of Petroleum Producers] with their ‘rebranding’ campaign by bringing Alberta’s newest tourist attractions to the world’s doorstep,” said Mike Hudema with Greenpeace Canada. 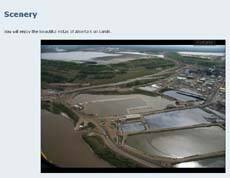 “Enjoy the beautiful vistas of Alberta’s oilsands,” says Greenpeace’s tourism site. “Any visitor to the Alberta tarsands can see the pollution, smell the sulphur, taste the toxins and hear the air cannons — we’re saving them the trip,” he said. The site suggests that visitors start the day early with a propane cannon wake-up call, and try sailing on tailings ponds, man-made lakes that hold toxic waste left over from the oilsands extraction process. “These ponds are so dangerous that oil companies use cannons and scarecrows to keep ducks and birds from dying on the oil-slicked surface. When catching the strong winds on these ponds, be sure not to capsize!” reads the site’s section on vacation ideas. Hudema said he would like to see the money being spent on the public relations campaign used to clean up the oilsands rather than improve Alberta’s global image. Earlier this week, an association of U.S. mayors passed a resolution urging American cities to stop using fuel from the oilsands. This entry was posted on June 26, 2008 at 11:26 pm	and is filed under Uncategorized. Tagged: cannon wake-up call, dirty oil, emissions, fort mcmurray, greenhouse gases, oil sands, provincial government, stelmach, tar sands, tourism, toxic lakes. You can follow any responses to this entry through the RSS 2.0 feed. You can leave a response, or trackback from your own site.